Upscale gastropub located in the leafy suburb of Anchorage. : The phrase “casual upscale” could have been coined especially to describe The Village Anchor, which has a tiny dining room with a fireplace, wood paneling and copies of Old Masters oil paintings inserted in the ceiling. Most of the seating on the upper level of this popular Anchorage gastropub is outdoors, on a covered lanai and an open deck. Go downstairs to the Sea Hag Bar for another fireplace and a big screen TV. The extensive menu ranges from small plates (chicken skewers with Thai peanut sauce, green chile wontons) to generously portioned entrées (beer-braised short ribs, cast-iron seared sea scallops). Among the most popular dishes are the blackened fish tacos, ahi salad, vegetarian risotto and a meatloaf burger. Carrot cake with a cheesecake twist is among the signature desserts. Every Tuesday night there’s a $10 special of a selected entrée and glass of wine, and Sunday is all-you-can-eat fried chicken night. 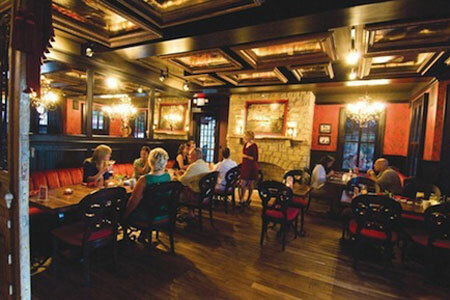 Experienced servers lovingly describe the house cocktails and wine and draft beer lists. The Village Anchor is a stop on Louisville’s Urban Bourbon Trail, too, so it’s a great place to linger after dinner with friends and a glass of something special to sip.